We’d love your help. Let us know what’s wrong with this preview of Give Yourself a Break by Kim Fredrickson. Licensed marriage and family therapist Kim Fredrickson wants readers to stop beating themselves Many people are used to showing compassion to others. What many of us have trouble with is showing that same compassion to ourselves. Too often we say things to ourselves that we would never say to a friend. All this negative self-talk can have a devastating effect on our lives. To ask other readers questions about Give Yourself a Break, please sign up. Is this book a good read? I cannot in good conscience finish this book. Maybe it's just me but this book seems very self-centered. I am a wonderful person. I am a special person. I am this. I am that. I can do this and that. It's not my fault. And on and on. Every day I thank God for who I am and for the the things I have in my life. Every day I make mistakes ( I am a sinner after all) but I turn to God to help me, not myself. I ask for forgiveness, and hope to learn from my mistakes. I feel good when I help others not wh I cannot in good conscience finish this book. Maybe it's just me but this book seems very self-centered. I am a wonderful person. I am a special person. I am this. I am that. I can do this and that. It's not my fault. And on and on. Every day I thank God for who I am and for the the things I have in my life. Every day I make mistakes ( I am a sinner after all) but I turn to God to help me, not myself. I ask for forgiveness, and hope to learn from my mistakes. I feel good when I help others not when I put myself on a pedestal. She does reference God but then goes back to you saying I am and I can to make yourself better. I am probably not the audience she intended this book for. But I would not recommend it to anyone. Kim Fredrickson in her new book, “Give Yourself A Break” published by Revell gives us Turning Your Inner Critic into a Compassionate Friend. As children we’re taught to treat others the way we would like to be treated. But as adults, we often need to turn that old maxim around. We’re good at showing compassion to other people–but many of us have trouble showing that same compassion to ourselves. 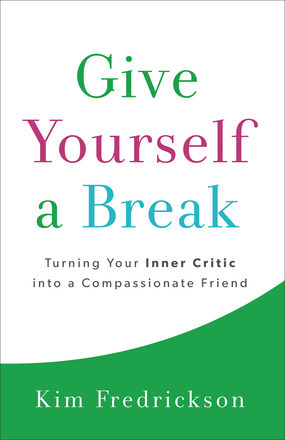 We say things to our Kim Fredrickson in her new book, “Give Yourself A Break” published by Revell gives us Turning Your Inner Critic into a Compassionate Friend. As children we’re taught to treat others the way we would like to be treated. But as adults, we often need to turn that old maxim around. We’re good at showing compassion to other people–but many of us have trouble showing that same compassion to ourselves. We say things to ourselves we would never say to a friend. And all this negative self-talk can have a devastating effect on our lives and relationships. Licensed marriage and family therapist Kim Fredrickson wants you to stop beating yourself up. Grounding her advice in Scripture, she offers practical steps, specific exercises, and compassionate words to say in order to build a loving relationship with yourself. Through inspiring stories of transformation, she’ll help you learn to show yourself the kind of grace and understanding you offer to others–and to change your relationships, your outlook on life, and your view of yourself in the process. The Dictionary defines “Compassion” as: sympathetic consciousness of others’ distress together with a desire to alleviate it. When we see someone suffering we want to help to stop whatever is causing them to suffer. We do not seem to have that same consideration for ourselves. Ms. Fredrickson understands that we are hard on ourselves when we fail, make mistakes, make poor decisions or could not foresee the future. If you are nodding your head right now then perhaps you might be doing this as well. It is time for self-compassion, interacting kindly with yourself with both truth and grace. If we have self-compassion it will help all of our relationships. Ms. Fredrickson gives us ten chapters to help us deal with our lack and build our necessary Self-Care with Practical Tools To Build A Compassionate Relationship With Yourself. If you want to have a better relationship with yourself and then with both God and others then this is the book for you. It would also be a great gift for friends and family so that they be helped as well. I really enjoyed reading this book by this licensed marriage and family therapist of over 30 years. I found it extremely helpful in my own life as well as helping and relating to other family members. The author describes on page 12 her hopes for this book and why she wrote it-“to provide some understanding of why self-compassion is so hard to extend to ourselves, and second, that it provides hope and and practical help in learning to relate to ourselves in healthy and gracious ways”. This book is I really enjoyed reading this book by this licensed marriage and family therapist of over 30 years. I found it extremely helpful in my own life as well as helping and relating to other family members. This book is all about having self-compassion. She explains that self-compassion is essential for handling and recovering from the difficulties of life. She defines self compassion as having the same concern for your own pain and welfare. She goes on to describe it is not self-pity but a balance of truth. She goes into further detail with describing the differences between self compassion and self-esteem. This book is divided up into 10 chapters with concluding reflection questions at the end of each chapter. She always includes an Appendix B in the back with suggestions on using this book and material with groups, which I found very helpful. Chapter 6 about “Self Care” was extremely helpful to me and I learned alot in that chapter. I would highly recommend this self help book if you would like to improve your relationship with yourself and show compassion to yourself and others like God did. When you were growing up, you were probably taught that you should treat others the way that you would like to be treated. But, think about how you interact with the people in your life. Do you actually treat yourself as well as you treat the people around you? * Are you kinder to others than you are to yourself? * Do you find it easier to forgive others for their mistakes than for your own? * Do you hear your inner voice saying things to yourself that you would never say to someone else? If you fin When you were growing up, you were probably taught that you should treat others the way that you would like to be treated. But, think about how you interact with the people in your life. Do you actually treat yourself as well as you treat the people around you? If you find yourself answering yes to any of these questions, I encourage you to add Give Yourself A Break - Turning Your Inner Critic Into A Compassionate Friend by Kim Fredrickson to your reading list. In Give Yourself A Break, licensed marriage and family therapist and certified Christian life coach Kim Fredrickson examines why we have such a hard time being compassionate with ourselves. She also shows why self-compassion is an essential component to a healthy and emotionally balanced life! Kim provides us with plenty of practical tools to help us take better care of ourselves, shows how self-compassion is foundational to all of our relationships, and points to God as our role model for compassion and tenderness. She also examines some of the life experiences that make us vulnerable to neglecting our needs and teaches us how to create a positive self-care plan that can help us transform our lives. Give Yourself A Break is a great Christian self-help book for those who are looking for a biblically-based resource to help them improve their lives. Licensed marriage and family therapist Kim Fredrickson wants readers to stop beating themselves up. Grounding her advice in the Bible, she offers practical steps and specific exercises to reprogram our thought lives. She helps us learn to show ourselves the kind of grace and understanding we offer to others--and to change our relationships, our outlook on life, and our view of ourselves in the process. While I agree with the author on most fronts. I don't want to ever take the risk of not listening to that part of me that says, ya know maybe those that speak out against might have a point. And usually after this thought I use some time with God and ask Him to help me see their point number and number two change me to suit Him. We have to sometimes or most offer grace to those around us after all that is what God does for us. He offered us grace in order for us to give it away to others. We need to try harder to do just that. Hating everyone just because we don't approve is not the way to God's heart, and frankly we weren't made that way. God in all His goodness wants us to use Him and Jesus for examples on how to live and to show others the way to Him. Setting yourself up by talking bad to yourself isn't the way either. Being overly critically of yourself can become a very hard habit to break, I know this first hand but I also want to remain as humble as possible so that I can see my faults more clearly. The author has wrote a good book with sound advice to get us started down the right road to self acceptance. There is no one harder on themselves in life than moms and probably women in general. We are our own worst critic. It's hard not to play the comparison game, beat ourselves up for our mistakes and suffer from feelings of guilt for no doing it all. Kim Fredrickson reminds us all of grace and loving ourselves in her book Give Yourself a Break. Why is it so easy for us to show compassion to our kids, friends and family but no ourselves? Why do we continue to beat ourselves up day after day? Fredrick There is no one harder on themselves in life than moms and probably women in general. We are our own worst critic. It's hard not to play the comparison game, beat ourselves up for our mistakes and suffer from feelings of guilt for no doing it all. Kim Fredrickson reminds us all of grace and loving ourselves in her book Give Yourself a Break. Why is it so easy for us to show compassion to our kids, friends and family but no ourselves? Why do we continue to beat ourselves up day after day? Fredrickson gently guides us on a journey of self love and compassion. It's hard to sum up his book because it was so interesting on so many levels and I really like her easy style of writing. One of the things that good out to me the most was the chapter on how self-compassion can help all of our other relationships. For those of us that are focused on everyone but ourselves, this really puts it all into perspective. It's kind of like the same idea that if you don't make time for yourself, you're not going to be your best self. Paying attention to yourself and loving yourself does actually help with all those other people that we tend to focus the most on. This book is written in a very caring way. Not only that, but it gives practical guidance and step-by-step instruction on how to go about caring for ourselves Of course, I read this book through the lens of chronic illness and disability. We are probably more in need of this book than healthy readers are, honestly! We're so hard on ourselves, hardly ever granting ourselves grace. And so much of our lives is out of necessity focused on ourselves, we refuse to spend any extra effort of self-care. I really don’t believe in coincidence, so when a major oversight on my part caused a disappointing and inconvenient plight for my family, it was not for nothing that Give Yourself a Break by Kim Fredrickson was already on my night stand waiting to be read. I needed to hear its message of “self-compassion” — the truth that I am worthy of the same grace that I would offer to someone else in my situation. Kim makes an important distinction between self-compassion and self-pity, where we “wallow in I really don’t believe in coincidence, so when a major oversight on my part caused a disappointing and inconvenient plight for my family, it was not for nothing that Give Yourself a Break by Kim Fredrickson was already on my night stand waiting to be read. I needed to hear its message of “self-compassion” — the truth that I am worthy of the same grace that I would offer to someone else in my situation. Kim makes an important distinction between self-compassion and self-pity, where we “wallow in the shame of what we have done.” Nor is self-compassion the same as complacency where we give ourselves permission to just flop around ineffectively. “Instead, it is the idea that we can be kind to ourselves when we fail and treat ourselves with the caring support we would give another who is struggling.” For me, her most helpful advice was to avoid condemnation, which is a waste of time; and, instead, to forgive ourselves, to analyze the situation in order to avoid a repeat performance, and then to embrace change for the future. A licensed marriage and family therapist, Kim has credentials and has put in her time as a professional helper, but the voice that reaches out from the pages of her book is that of a friend and a wise counselor, elevating her writing beyond the genre of just another happy-talking, self-help book. Kim shares case studies lifted from her practice as well as situations from her own childhood and her experiences as a mum. The book includes a six-page appendix of verses which trumpet God’s love, care, and compassion which I savored like a long-awaited letter one sunny afternoon. A huge factor in silencing one’s inner critic is learning to practice positive self-talk. Having a little trouble finding the words? No problem! Give Yourself a Break includes scripted messages to read and practice. It will feel awkward and stilted, but, with practice, you will learn to speak compassion to yourself in your own words. •Changing how you care for yourself takes awareness, intentional thought, and a plan. •We often live as if we should be perfect, and we are devastated when we fail . . .
•Don’t hold things against yourself. I will help you,” (Isaiah 41:13). So, self, what will it be? Licensed marriage and family therapist Kim Fredrickson offers a unique approach to self-compassion. I majored in counseling when I was in college so I found it really fascinating and a useful resource. It is well-written gentle in its text, and Biblically sound. I’m excited that there is a book on this topic because there aren’t many. As Christians, it can be really difficult to incorporate the practice of self-compassion. “As children we’re taught to treat others the way we would like to be treat Licensed marriage and family therapist Kim Fredrickson offers a unique approach to self-compassion. I majored in counseling when I was in college so I found it really fascinating and a useful resource. It is well-written gentle in its text, and Biblically sound. I’m excited that there is a book on this topic because there aren’t many. Give Yourself a Break: Turning Your Inner Critic into a Compassionate Friend by Kim Fredrickson offers important points about the topic of self-compassion. I know that it’s easier for me at least, when something goes wrong, to be harder on myself than I typically would be on others - and I am sure this is true of many other individuals as well. To work against this unhealthy way of thinking, Fredrickson gives many practical tips and tools to help anyone This review is also posted on Book by Book. Give Yourself a Break: Turning Your Inner Critic into a Compassionate Friend by Kim Fredrickson offers important points about the topic of self-compassion. I know that it’s easier for me at least, when something goes wrong, to be harder on myself than I typically would be on others - and I am sure this is true of many other individuals as well. To work against this unhealthy way of thinking, Fredrickson gives many practical tips and tools to help anyone begin and keep employing self-compassion. Give Yourself a Break is a valuable and beneficial resource for positive self-care and I recommend it. I really liked this book. There is much in it that helped me explain much of my behavior and that of others. We are to show the same compassion to ourselves that we do to others and that God shows to us. We are too hard on ourselves, the author writes. We know we are forgiven for our sins, but knowing it in our head is different than knowing it in our heart. I would especially recommend this book to parents. Children do not have the brain development to be balanced in their thinking after they h I really liked this book. There is much in it that helped me explain much of my behavior and that of others. We are to show the same compassion to ourselves that we do to others and that God shows to us. We are too hard on ourselves, the author writes. We know we are forgiven for our sins, but knowing it in our head is different than knowing it in our heart. I would especially recommend this book to parents. Children do not have the brain development to be balanced in their thinking after they have done wrong. Parents need to help them learn that skill. And much of how we behave as adults comes from our perceptions when kids. You can see my complete review at http://bit.ly/1C6qBBH. Fredrickson comes across as a patient therapist, gentle mom, and happy Christian. She also comes across as a terrible, cheesy writer. Her style makes me cringe, like making me eat one of those fluffy meringues that I detest. Especially the monologues that she uses too liberally. A book that had immediate application and immediate self-soothing effect. Till today, it's my number one choice for gift for friends who tend to be critical of themselves. It really worked like magic. Through this book, you learn what to say to yourself when you make a mistake. You learn not to scold yourself and make yourself feel lousy, but how to be your own encourager and friend. It's so easy and compelling to read. Kim really did a great job writing this book. I have always been a little apprehensive about books like these, but I gave this book a try. By giving this book a try I found myself to really enjoy it. It was written well. It was also a very well informed book. I can see a lot of people enjoying this book and finding it to help them. I really liked that after each chapter there was reflection questions. It really makes you think about what you just read and helps let it set in. Compassionate self-help book about how to treat yourself with both grace and truth. The book is written from the Christian standpoint, but it is not preachy and non-believer can read it too without feeling influenced by this standpoint. I recognize the deep truth that one can be the worst enemy to themselves, to treat themselves more harshly and untruthfully that the real enemy would. And also that we are precious, created by God Himself and we have been given the stewardship of us (our body, mi Compassionate self-help book about how to treat yourself with both grace and truth. I recognize the deep truth that one can be the worst enemy to themselves, to treat themselves more harshly and untruthfully that the real enemy would. And also that we are precious, created by God Himself and we have been given the stewardship of us (our body, mind and soul) by Him, too. But it is very hard to really do that, to treat ourselved like that, in real life. And how we treat ourselves vcan (and will) affect the other areas of our lives, too. Simple truths? Yes. everybody knows them? Yes? Do we behave like that? No. Ms Fredrickson gently points these truths and offers a lot of in-depth, well-explained information about the nature and consequences inner/learned attitudes and the tips to self-soothing procedures. I, coming from the cultural background where the honest (which sometimes means honest without any grace) approach is considered the part of the culture, have been a bit discouraged first - by the supposed "too much sweetness". I say "supposed" - because I came to understood that the authoress does not mrean to skip out the truth - but to treat ourselves gracefully while realizing/admitting the truth and acting on it graciously to both us and the other persons related (if there are any). And I quite like that. I need to incorporate this attitude more. And I can well use some of the offered practices, too. I find this book being complementary to another wonderful self-help book I have read recently: "F*ck Feelings: One Shrink's Practical Advice for Managing All Life's Impossible Problems" (non-Christian and quite to-your-face book, but very beneficial when leaving out all the (truly innecessary) cussing). This book well promotes the gentleness and the value of every person - and this person should be us, too, as we walk with ourselves daily every day and truly, we are the only one person we are responsible for. This was a pretty cheesy read. There were some good practical points and I appreciated the chapters on how self-compassion influences relationships as well as the emphasis on self-care but otherwise, I felt like there was a lot of cheesy fluff to read through. I wanted to put the book down on more than one occasion but pushed through to the end. Overall had some good principles. Had some strange ideas too though. I was disappointed to see so much reliance on "self-help" instead of on God for help. Jesus is the best friend we could ever have. Relying on Him for compassion is the best way, not relying on self. We will always let ourselves down. But Jesus never will. We need to look to Him, not to self. I really enjoyed this book. It gives yourself advice on turning yourself from a your inner critic into a compassionate friend. It first starts with what is and what compassion is not. It also says that we can learn to be a kind person who encourages. It also talks about anxiety in relationships. It talks about do you really treat yourself as well as you treat other people around you. Are you kinder to others or do you find it easier to forgive others than yourself? The people who feel this way should read this book. She examines life experiences that make us neglected and vulnerable. I love how she uses a biblical approach. It is a great read for those who have self image problems. Remember we are created by God as a valuable person. God created us how he wanted us to be. I didn't end up finishing this although I believe this is no fault of the author. I just didn't connect with what the author was saying. I believe this will fit well with certain readers, just not readers like myself. Overall it's intelligently written and I do believe will be the perfect book for someone out there. I received an ARC through the publisher in exchange for an honest review. This in no way influenced my opinion. I would recommend this book to everyone to read. I just recently went through survivors guilt and it was something I never thought would happen to me. This book actually helped me through this by showing me how to have compassion for myself. Great book and written very well. I received this book for free through goodreads for my personal opinion. Compassion. I worked through many of the exercises here and discovered a notable absence of it in my life, not towards others but towards myself.